This project was created on 02/27/2016 and last updated a year ago. R.Ian is named after Ian Murdock, founder of Debian, the famous Linux Distribution. This robot is meant to be simple to build, assemble and begin programming with. It means that in little time, one should be able to build the robot, and program it to have it running simple obstacle avoidance obstacles. However, i want to design it so that it can be upgraded if the user wants to, and also being able (even without upgrades) to run more advanced algorithms. The goal is to have a robot for education that is relatively cheap, that the learning person can assemble by her/himself in order to better understand how it works (but can also be used fully assembled if he or she wants to focus on programming only), and easy to program even with little to no programming experience. It is meant to be used to LEARN programming. This robot is meant to be cheap (less than 50$), simple to build (3D printing most part), easy to assemble (just screwing things together), easy to program (using Arduino for start), easy to improve (fixation points are all over the chassis to add stuff), easy to modify (everything is open source, all schematics are available, and provided in open formats used by free open source software that are available on linux, windows and mac). The base of the robot is an Arduino nano controlling two continuous rotation servos motors for movement, and a few contact switches, a third servo and an infrared rangefinder. This renders the robot capable of simple obstacle avoidance programs. This is the cheapest version of the robot. However, a second stage can be added, with a Raspberry pi zero, and a wifi usb key. 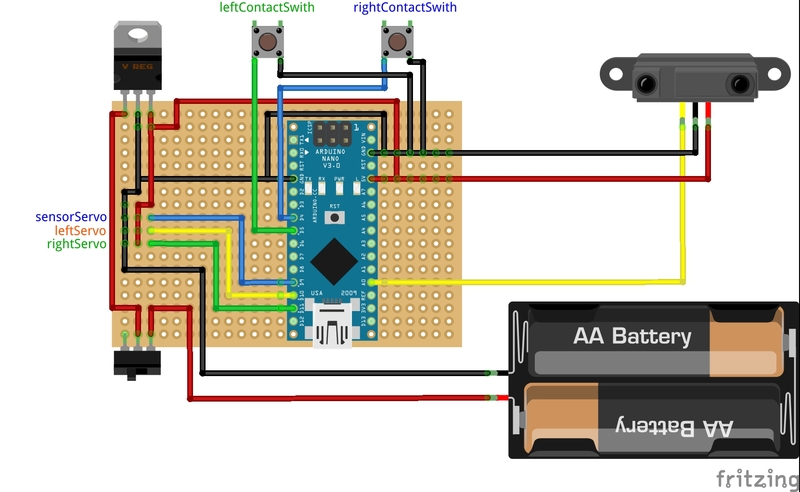 The pi and the Arduino are interconnected via serial with logic level conversion. In this configuration, the Arduino is programmed to answer to serial commands. It can be asked to do a few things (moving, turning the sensor, etc) or to return informations (sensors values, battery level, etc). Then the Raspberry pi zero sends commands over serial via a small library, and the robot can be programmed over the air, via wifi. If the robot is alone, it creates a hotspot used to program it. If another robot hotspot is detected, other robots will try to connect to it, allowing collaborative work. I plan on making a small base station generating the first hotspot, and containing the wiki, docs, source codes, etc. Lipo charger board support. It has holes to secure it to the chassis, and claws hold the board in place. Very basic lipo charger board support. It only has holes to secure it to the chassis. To secure the actual charger to this support, use double tape. A non tape version is coming. For this project i had to develop wheels and tyres for 3D printing. I wanted to go farther, and make tracks, increase how configurable everything is, and make everything cleaner, more modular, more functionnal. I thus decided to create the project OpenWheel, that is as open source as this one, and expands beyond the scope of the orginal project. In the end, i&apos;ll generate a new chassis using those wheels rather than the old one. While this means no direct progress on this robot, it announces upcoming evolution. And this will be a strong evolution for R.Ian. In the next iteration, it will be much more modular, meaning that you&apos;ll be able to change the configuration of the robot in an easier way (i mean, print the chassis, and decide whatever configuration you want, print the corresponding parts, and put them in place. And when you want to change, remove said part, and replace it with a variation). We&apos;ll also address most of the problems R.Ian has currently (main problem is the flimsiness of the wheel due to the servo&apos;s axle being, well, flimsy). This may also cause a slight increase in the cost of the project (more 3D printing to do), but i want to provide a strong base, make it fully functionnal, and kids resistant first. From there, we&apos;ll work on decreasing the costs. As i said in a previous log, the robot has been tested by students for two lessons, and it worked. The video isn&apos;t that great because OpenShot was not functionnal on my station, neither was KdeEnlive (i&apos;ll install a clean Debian soon in place of my OpenSuse that works but has some bugs now and then). It&apos;s programmed with a simple obstacle avoidance algorithm, and it ran not so bad. Of course, there is a huge amount of room for optimization, but this was just a test program i made in 2 minutes. I need to change a few things on the board, such as the power switch position (currently, the motors run when USB is plugged). Where will the Raspberry pi go? For this, there are two solutions : over the electronics, or under it. If going over, we&apos;ll have to make another stage to the robot. It will cause it to have another piece to print, but it makes it easier to upgrade afterwards. You build the basic robot, and if you want, you add another layer with extra stuff. The second solution is to have it go under the electronics board. In that case, i&apos;d use a 2*20 connector, so that the electronics board would plug directly onto the pi, that would go in it&apos;s current position. The plus side is that it&apos;s easy to connect the two boards. It is the solution i chose for R.Hasika, as this other robot has a Raspi in all cases. Here, the raspi is optionnal, so we&apos;ll have to figure this solution out. Furthermore, we want to keep costs as low as possible, so we opt for the Pi Zero as a primary solution, so we can think about optimizing space while maintaining easy maintenance, hacking and configuration. In all cases, i plan on making it possible to use each model of Raspberry pi form factor (B+/2/3, A+, Zero), so two or three tray models. I think that the pi zero and the A+ make the most sense (low power and cheaper) for this robot, but i want to provide options to users. Anyway, i&apos;ll start with the zero tray, then the A+, and finish with the B+ format. I made a new part for this robot in order to hold the lipo charger board presented in the previous log, the TP4056. It has claws to hold the board in place, unlike the previous version that was just a flat part with screw holes and used double face tape to secure it. It&apos;s also less visible. Anyway, there are input pins if it&apos;s necessary to provide 5V by another mean than the USB port (solar panel, charging station, etc). Now the robot can be used easily without having anything to disassemble to charge it. In order to make the robot as hassle free as possible, i want it to be charged without removing the battery. I used pololu zumo robots for teaching computer science, and those have 4 NIMH batteries. Not only the single lipo battery i used provides roughly the same energy for half the mass and a a lower price, but LiPo is simple to charge, hence the vast amounts of cheap LiPo charging boards. I selected not the cheapest, but still a cheap board, at less than 1.5$ a piece, with over discharge protection (and of course over charge protection!). I bought a pack of 10 for 13$ with free shipping, from Aliexpress seller Shenzhen factory. This board is based on the very common TP4056 chip. You can see a high quality and detailed review of a more basic version of this board following this link. Compared to the one tested above, mine adds tabs for load, thus you can have the battery and the load plugged at the same time. The charge maximum output current is given at 1.2A, and it is supposed to support simultaneous charge and discharge. From the same seller, a single board is less than 2.5$, with free shipping. The circuit changes in order to add this board are simple : battery wires goes on the charger, and the out + and - goes where the battery wires previously went. So no modification of the circuit board (that was the plan). This circuit board goes under the electronics board, on the base of the chassis. Room was planed for it, and fixation holes are available. However, i&apos;ll have to design a small plate with claws to hold the charger, and with the corresponding screw holes to secure it to the chassis. If one wants multiple batteries in a version of this robot, it is possible to do so without increasing charge time by adding multiple chargers and diodes on the output pins. More on that on R.Hasika project, which has 4 lipo batteries in parallel. Anyway, it also has input pads, so it is easy to add a barrel jack, and why not a 5v regulator so that the robot can be charged with various power bricks with a wider voltage range. This is not something i&apos;ll include in the default robot (to keep costs down), but certainly an option or a mod that can be done. Another use of the input pads could be to have some kind of pads on the robot in order to enable it to go to a charging station on it&apos;s own. I&apos;ll design such a station and work on this later on. First 2 sessions with 11th grade students. Today, i had my second programming class with 11th grade student, scientific option. Everything went well, and in less than 1 hour, they had coded multiple algorithms to the robot : obstacle avoidance with the contact switches, and then scanning ahead with the servo mounted front sensor. As i have not done the cover yet, for those two sessions, they used it without it. From this, i learnt a few things. the wheels are slightly wider than the contact switch lever. It is thus possible for an obstacle to miss the switch lever, but hit the wheel. A good body design should protect the wheels however. I will thus be improving this design in the next weeks to solve those issues. About the students : they are 11th graders from Guadeloupe (a french west indies island), and have no programming class at school. I go there once a week, for an hour, and bring robots for them to program and learn programming. It&apos;s not an official class, i&apos;m not paid for this or anything. However, next year, i&apos;ll use this robot for my computer science class. Again, feel free to download the fritzing version of this breadboard circuit on the project&apos;s Github. In order to simplify the schematics, i didn&apos;t include the servos, but the labels show where they go. You can browse the github for various formats of this image, and also download the fritzing file. I&apos;ll go more in depth in a next log. Before i make a proper tutorial for this very topic, i&apos;ll present here the assembly of R.Ian. After that, another optional phase is to secure the contact switches in front. It is done with just screws. Those sensors are wired to the ground for one pin, and to a GPIO in pullup mode for the other. Prior to securing the motors in place, they should be calibrated so that the neutral point is at 90° angle (thus immobile). To do so, connect them to an Arduino, and set the position to 90°, then adjust the little screw until they stand still. The holes should on the chassis should be aligned with the servo ears properly, only 4 screws are needed to secure both motors. At this point, the battery must be installed, but prior to doing that, the battery tabs must be put in place. For that purpose, follow the detailed instruction on this topic from R.Hasika (those instructions have pictures too). Then the battery should stay in place after applying a little force to get it in it&apos;s slot. The + of the battery goes to the Vin of the voltage regulator, and the - goes to the ground. A switch is a good idea to be able to turn the robot off. Then we secure the electronics plate on the chassis using 3mm screws, the USB port beeing at the back. Now, using USB the robot can be programmed properly. I&apos;ll make a log on the electronics board and wiring later on. Once the previous parts are printed, what is missing is a way to secure the electronics to the chassis.For that purpose, i designed this part made for printing in PLA, ABS, nylon or similar material. It screws to the chassis via 3mm screws, and the main board scerws to it with 4 m2 screws. Nothing too fancy here, but with this part, we can assemble a fully functional robot. At line 648, you&apos;ll find a module called electronicsPlate() (or it&apos;s definition). It can be called simply with electronicsPlate(); and no arguments . Ooops, I did not look inside r_ian.scad. Now I see how it works. Thanks - this is a good starting point. How cheap is cheap? $50? $100? And what 5V regualtor did you get? By cheap i mean less than 50$. For now, with room for improvement, i&apos;m at around 35€, so let&apos;s say 40$, including everything needed for the robot. As for the regulator, it&apos;s a pololu step up one with high efficiency (80-90 when converting 3.3 to 5v), and 1A max current out. It works properly, and the robot survived it&apos;s second programming session with the students (and this time without my supervision) . This is a 3 servo, Arduino Nano controlled robot that climbs pegs on a board. You are about to report the project "R.Ian, simple and easy built robot for education", please tell us the reason.